I am so very thankful to learn that Joel Osteen has apologized for the remarks that he made in his recent interview with Larry King. I wrote about the interview last week and was very disappointed with Osteen’s failure to present a clear and unambiguous declaration of the Gospel. One of Larry Kingâ€™s recent interviews has been very disappointing. In this case, the interviewer is not the one disappointing me, but the interviewee, Rev. 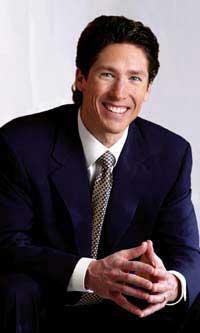 Joel Osteen. I think it is unfortunate that Osteen, having voiced his agreement with the prosperity-gospel, is still put forward as a spokesman for evangelicalism. Moreover, Osteen makes remarks that I donâ€™t know how to interpret except as a flat out rejection of the exclusivity of the Gospel message. The following is from Larry Kingâ€™s interview with Joel Osteen. I hope that Osteen just misspoke and will retract some of this. The end is especially troubling. that. But same principal in the book. OSTEEN: We do have rules. But the main rule to me is to honor God with your life. To life a life of integrity. Not be selfish. You know, help others. But that’s really the essence of the Christian faith. KING: Because we’ve had ministers on who said, your record don’t count. You either believe in Christ or you don’t. If you believe in Christ, you are, you are going to heaven. And if you don’t no matter what you’ve done in your life, you ain’t. KING: If you believe you have to believe in Christ? They’re wrong, aren’t hey? There are many problems in this exchange, and most of the readers of this blog will spot them without my commenting upon them point by point. Yet there is one item that is particularly troubling. When Larry King asks about the destiny of sincere Muslims, Osteen will not come out and say that Jesus is the only way of Salvation. I do not understand why Osteen couldnâ€™t just quote the Bible (maybe John 14:6 or Acts 4:12)? If he canâ€™t bring himself to say it in his own words, why canâ€™t he just quote the Bible and leave it at that? My fear is that unbelievers hearing this interview probably did not glean the truth that every person who has ever lived faces judgment because of their sin and that faith alone in the crucified and risen Christ is manâ€™s only hope of salvation. This is the heart of the Gospel, and it was not at all clear in Osteenâ€™s interview. I donâ€™t think that this man believes that there is more than one way of salvation, but the interview seems to imply that people of other faiths might be okay after all. So I am disappointed and hoping for a retraction or perhaps some clarification. I hope one or both comes soon. An interesting story in todayâ€™s New York Times talks about the population of evangelicals living in New York City. So how do New Yorkers, by and large, feel about evangelicals in there midst? â€œStill, the prevailing culture of this city is still unsure of what to make of evangelical Christians, most churchgoers interviewed agreed. They can be treated with contempt and other times curiosity. Mickey H. Sanchez, 26, who works for a city councilman and attends Redeemer Presbyterian Church, said he finds that people are often confused when they discover that he’s an evangelical. 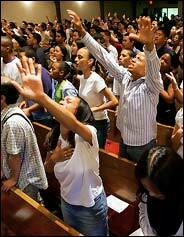 â€˜That you’re in New York as an evangelical, it has to be processed by them,â€™ he saidâ€ (source). I guess meeting a Martian would be the only thing stranger than meeting an evangelical in New York. Still, the article discusses the burgeoning evangelical population in the city. This population is presumably going to populate the upcoming Billy Graham crusade. This is unfortunate. I think it would be better if the evangelistic crusade could actually reach some non-evangelicals. Hopefully, we havenâ€™t come to the point where seeing a Martian at the crusade would be the only thing stranger than seeing a non-evangelical there. Feet Firmly Planted in Mid-Air? 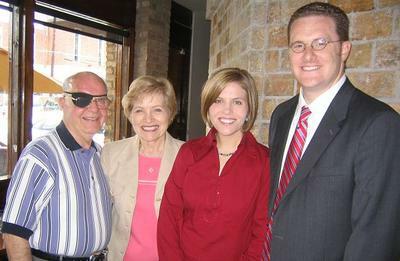 Howard Hendricks, his wife Jeanne, my wife Susan, and me at a DTS post-graduation party, May 7, 2005.
â€œHave you ever left a bible study feeling like you have your feet firmly planted in mid-air?â€ That is the question that Dr. Howard Hendricks used to ask when I was one of his Hermeneutics students during my first semester at Dallas Theological Seminary. He knew, as most of the rest of us knew, how so many small-group bible studies are racked with superficiality and are â€œbible studiesâ€ in name only. How many times had I myself sat in a bible-study circle of earnest young believers where the leader reads a text then asks the question: â€œWhat does this verse mean to you?â€ The inevitable response from the members in the circle is a cascade of ill-conceived interpretations that contradict one another, ramble into therapeutic incoherence, and ultimately miss the point of the Scripture. Then, after all had offered their version of â€œwhat this verse means to me,â€ the leader says â€œamenâ€ and closes with prayer with everyone feeling satisfied that they had shared their feelings with one another. What I learned from Dr. Hendricks is that those kinds of â€œbible studiesâ€ are less a study of the Bible than they are a haphazard pooling of everyoneâ€™s ignorance. As I finish my third semester of teaching hermeneutics to undergraduate and graduate students, I am contemplating Dr. Hendricksâ€™ question again. It is clear to me that as long as there have been readers of the Bible, there have been disagreements over the interpretation of Scripture. This situation is due to no deficiency in the Scripture, but to the fallenness of its readers. How do we get our feet planted on the ground in our interpretation of the Bible? The one question that must be answered as we interpret the Scriptures is what is the criterion by which we evaluate whether a particular interpretation is valid or invalid. Think about the young people sitting in the bible-study circle offering their contradicting interpretations. When interpretations contradict, it is possible for all of them to be wrong or for one of them to be correct, but it is logically impossible for all of them to be correct! So what is the criterion by which we distinguish a good interpretation from a bad interpretation? I answer that question to my hermeneutics students by pointing out that any written communication involves three components: (1) author, (2) text, and (3) reader. 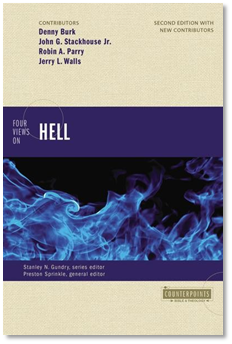 Hermeneutical theories differ from one another in where they locate meaning. Some say the author controls meaning, some say the text controls meaning, and others say the reader controls meaning. For instance, the New Criticism is an example of the second approach. This mode of interpretation was popular among literary critics from the 1920â€™s to the early 1960â€™s, and it focused its attention on the text as the determiner of meaning. Meaning was thought to be a property of the text itself, quite apart from anything external to it (including the author and the reader!). If you are familiar with the work of T. S. Eliot or Robert Penn Warren, then you know a little bit about the text-focused work of the New Critics. I recently blogged on Stanley Fish, a prominent contemporary literary theorist, who falls in the third category. He would argue that it is not the author who gives meaning to a text, but the reader. Fish, who is not the originator of this point of view, is but one of many literary critics that belong to the reader-response school of interpretationâ€”â€œa group of approaches to understanding literature that have in common an emphasis on the reader’s role in the creation of the meaning of a literary work.â€ This approach is all the rage today in universities across America. As with the New Criticism, the reader-response school of interpretation has not only affected the interpretation of biblical texts, but also the interpretation secular texts as well. Recent controversy over the role of federal judges in the intepretion of the U. S. Constitution is fundamentally a debate about who controls the meaning of texts: the author (i.e., the framers) or the readers (i.e., the judges). The hermeneutical approach that I advocate to my students is that the author is the controller of meaning. In other words, meaning is defined as the message that the author consciously wills to convey through the words that he uses. That means that all attempts to distinguish valid interpretations from invalid interpretations must be grounded in what the author willed to communicate. This is essentially the common sense approach to interpretation. When you read the words that I have written in this blog, you are trying to understand what I mean by what I say. If you were to have a conversation with me, you would try to interpret what I mean by what I say. If you try to read your own meaning into what Iâ€™m saying or writing, then there will be no way for us to communicate. You would never hear me, but only yourself. Common sense says that you should try to understand me (the author) and my intention in writing (the text) as you read (the reader). An author-centered approach is also the one that best accords with what the Bible teaches. I could point to many texts, but let me select one: â€œBut know this first of all, that no prophecy of Scripture is a matter of one’s own interpretation, for no prophecy was ever made by an act of human will, but men moved by the Holy Spirit spoke from Godâ€ (1 Peter 1:20-21). According to this text, the authors of the Bible were given a Divine competence that enabled them to express adequately the revelation that God had given them. If you want to know what God means in the Bible, then you have to get to the bottom of what the Spirit-moved human author meant when he wrote. I say all of this so that I can encourage all of you Bible readers to plant your feet firmly on the ground of the Bible, Godâ€™s holy and infallible word. But you cannot have your feet planted firmly on the word if you are seeking to find meaning in any place other than the authorâ€™s intention. So when we are sitting in the Bible-study circle, and the leader asks, â€œWhat does this verse mean to you?â€, in love and with great patience, letâ€™s endeavor to point our brothers and sisters to find out what it meant to the author. This may throw a wrench in the stream-of-consciousness approach to Bible study that is so popular today, but it will be the only way to avoid having our feet planted firmly in mid-air. â€œHerman who?â€ is the question that many people ask when they first hear the word hermeneutics. Hermeneutics comes from the Greek word hermeneuÅ which simply means to interpret or to explain. 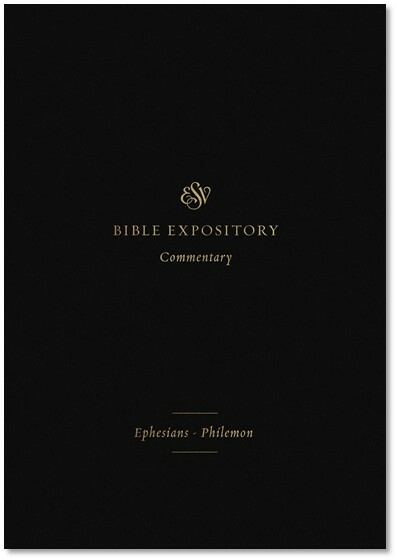 Textual hermeneutics is the study of the principles that govern the interpretation of texts. Because preaching the biblical text is the central work of the Christian minister, a hermeneutics course is typically included in the core curriculum of seminaries and bible colleges. Stanley Fish, Is There a Text in This Class? The Authority of Interpretive Communities (London and Cambridge, Mass: Harvard University Press, 1980. On this topic, I commend to you John Piperâ€™s sermon: â€œDiscerning the Will of God Concerning Homosexuality and Marriage,â€ preached August 7, 2004 at Bethlehem Baptist Church in Minneapolis, Minnesota. This definition and indeed my whole hermeneutics course rely almost entirely on the work of Robert H. Stein, A Basic Guide to Interpreting the Bible: Playing by the Rules (Grand Rapids: Baker, 1994). Dr. Stein was a great mentor to me when I worked as his graduate assistant at Southern Seminary. Other significant influences include: E. D. Hirsch, Validity in Interpretation (Yale University Press, 1979); Kevin J. Vanhoozer, Is There a Meaning in This Text? : The Bible, the Reader, and the Morality of Literary Knowledge (Zondervan, 1998). There is much to be said here about the issue of Sensus Plenoir, but I shall refrain for the sake of space. You Might Be an Evangelical If . . .
Common Grounds Online is running a hilarious blog-entry titled, â€œYou might be an evangelical if . . .â€ All of the following is an excerpt. Iâ€™m laughing out loud! If you say the word â€œjustâ€ more frequently than the word â€œJesusâ€ when you prayâ€¦you might be an evangelical. 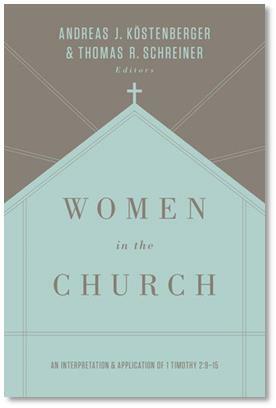 . .
(See John Stackhouseâ€™s Books & Culture review of Paul Bramadat, The Church on the Worldâ€™s Turfâ€¦. Its location in the rhetoric is similar to and often follows the word â€œjustâ€: â€œGod, we just [pause.. click] want to thank you for your son and to ask you…â€ By implying that the speaker is unable to finish a prayer because he or she is overwhelmed by the opportunity to communicate with God, this sound softens the believer’s petition [which otherwise might sound arrogant].